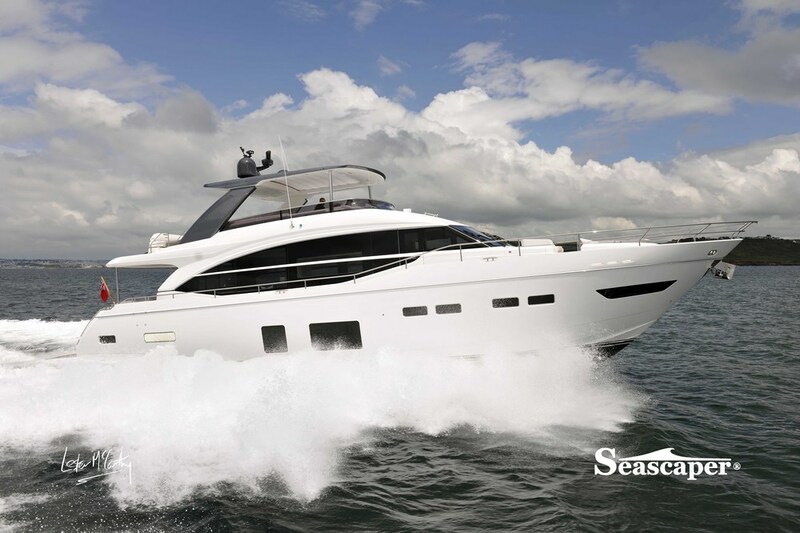 This is the new Princess 75 taken on a shoot for Motor Boat & Yachting magazine and you can read about it in their latest issue. This is Princess Yachts latest 35 knot comfortable cruising motoryacht featuring 3 guest cabins each with ensuite facilities. The owners cabin takes some beating - from your stately room forward you have your own staircase leading down to a lobby area where you find shiny glass and marble bathroom facilities. The saloon is wonderfully done, massive whole length windows and a level floor running all the way through the boat from the cockpit to the forward helm station. The light and airy saloon, the galley features sliding frosted glass panes and the floor is level throughout. The island in the background is the Mew Stone.